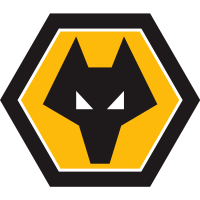 Matchday live text commentary blog from Molinuex where Wolves host Chelsea in the Premier League, 19:45 KO. I've been Josh Lees and that's all from me, thanks for following and be sure to tune into VAVEL UK for coverage on every Premier League game! For Chelsea, despite it being just their second defeat of the season they fall 10 points behind league leaders, Manchester City. It what was most definitely an evening to forget for the London side. Wolves finally have their win after going six games without three points before tonight. Raul Jimenez ended his goal drought to net his fourth goal of the season. FT' Its all over at Molinuex, what a result for Wolves! Two second half goals through Jimenez and Jota completed a superb turnaround, in a fantastic second half performance from the home side! 94' Jon Moss hasn't finished with his cards yet! Christensen is the man in the book this time. 90' FIVE minutes added on. 90' Another card from Moss as Alonso is booked for a poor challenge. 88' Final change for Wolves as Cavaleiro replaces Jota. 87' Golden chance! Fabregas finds space on the edge of the but hits his effort over! 85' Olivier Giroud is booked by Jon Moss for dissent. 83' A defensive move from Wolves as Dendoncker replaces goal scorer, Jimenez. 78' CLOSE! Hazard cuts in from the left and hits a fierce effort just over! 76' Final change for Chelsea as Kovacic replaces Kante. 72' Morgan Gibbs-White comes off and is replaced by Helder Costa. 68' You can tell it's nearly Christmas as Jon Moss as given out another card! Vinagre is the fourth man booked. 65' A double change for Chelsea as Oliver Giroud and Pedro replace Willian and Alvaro Morata. 63' Wolves have the lead! A fantastic low ball across goal from Doherty is met by Jota who taps home from close range to complete the comeback! 60' Wolves skipper, Connor Coady goes into the book for dissent. 58' Wolves are level! A brilliant through ball by Gibbs-White finds Jimenez who smashes through Kepa for his fourth Premier League goal of the season! GAME ON! 55' A superb long ball finds Willian however his effort from the edge of the box is way over. 53' Moutinho is the second Wolves man to pick up a yellow card. 46' We are back under way at Molinuex. On the whole, The Blues dominated with Hazard and Willian looking dangerous down both flanks. However, Wolves came into the clash towards the end of the half. This one is definitely not over yet! HT' Chelsea go into the break with the 1-0 lead through Ruben Loftus-Cheek's deflected effort just before the 20 minute mark. 39' Another superb challenge! Willian breaks through one-on-one but is denied by fantastic challenge by Ryan Bennett as the Brazilian looked to pull the trigger. 37' Great tackle! A loose ball in the box falls to Gibbs-White however the 18 year-old is brilliantly denied by a last ditch challenge from Fabregas. 37' Romain Saiss is the first man in Jon Moss' book after a late challenge on Willian. 24' CHANCE! Willian hits a curling free-kick from 25 yards which is superbly saved by Patricio for a corner! The resullting delivery comes to nothing. 18' GOAL! Chelsea open the scoring! Ruben Loftus-Cheek cuts in on his right and hits an effort from the edge of the box, which takes a wicked deflection and beats Patricio! 6' Great chance for Chelsea as Kante squares it for Hazard, fortunately for Wolves the Belgian's effort is weak and straight at Patricio. 2' First chance for Chelsea as Hazard latches onto a lobbed ball, however his effort from 10 yards is hit way over. 1' Chelsea get us under way at Molineux. Join us from around an hour before kick-off for confirmed starting XIs. 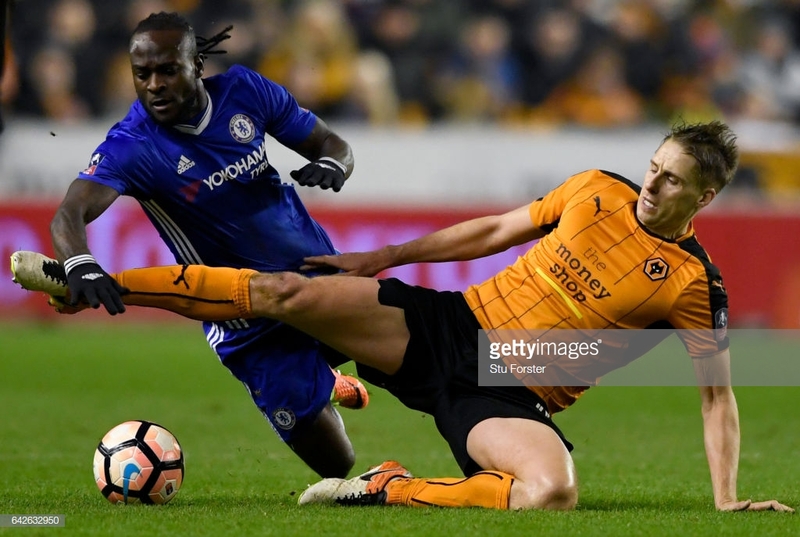 The last time the two sides locked horns resulted in victory for Chelsea as they ran out 2-0 winners in the FA Cup quarter final at Molineux last season. Two second half goals from Pedro and Diego Costa gave The Blues the win, and sent them on the way to cup glory, as two rounds later they lifted the famous FA Cup trophy at Wembley after a 1-0 win over Manchester United. Chelsea could be without defender, Marcos Alonso and midfielder, Matteo Kovacic after it was reported the two picked up injuries in preparation for tonight's game. Teenage sensation, Morgan Gibbs-White could be set to replace Neves for his first ever Premier League start after impressing with a string of solid performances off the bench in recent weeks. Wolves star man, Ruben Neves will miss tonight's game through suspension, after the Portuguese international picked up his fifth yellow card of the season in Friday's 2-1 defeat. 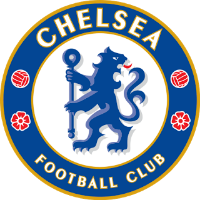 Chelsea head into tonight's clash on the back of derby victory, after defeating local rivals, Fulham 2-0 in the West London derby on Sunday. Goals either side of half-time through Pedro and Ruben Loftus-Cheek gave The Blues the win, and the bragging rights in West London. As well as struggling for points Nuno Espirito's side have struggled in front of goal, with just four goals in their last six games. Top scorer, Raul Jimenez has also struggled to find the net, with just one goal in his last nine which, came from the spot in a 3-2 defeat to Tottenham last month. The hosts go into the game in torrid form, after Friday's 2-1 defeat away Cardiff extended their winless run to six games. Chelsea however, have recorded just one defeat all season in the league which came in their last away outing at Wembley, where they were beaten 3-2 by Tottenham Hotspur. Hello, I'm Josh Lees and welcome to VAVEL's live commentary of Wolverhampton Wanderers vs Chelsea in the Premier League. Tonight's game kicks off at 7/45pm GMT, but don't worry we'll have plenty of pre live build up until kick off.